While the analogy might take a small stretch of the imagination, Orochi 2 is much like ladies’ face cream. Think about it: every five minutes a new and improved rejuvenating goo appears boasting the latest in technology that claims superiority over everything before it. But, in reality, it’s been squeezed from the same ten-year-old tube. We’re surprised there’s anything left in Omega Force’s well-used and rolled-up tube, in the same way we’re amazed that ‘Dynasty Warriors with knobs on’ still manages to score consistently well in Japanese games mags and achieve more-than-respectable sales figures. Does everyone who buys it have short-term memory loss? We’re not saying that this sequel to the spin-off of the mash-up of other sequels is terrible; Warriors games have always been the gaming equivalent of hitting a dustbin with a stick – great destructive fun for a short amount of time but then your head hurts and your hands ache. It just never really does anything new. Yes, the staunch fans might argue that the Versus mode is new (it’s actually a returning feature from DW4), as is Dream mode (which is essentially a re-named Legend mode) as well as 20 new stages and 13 new characters. 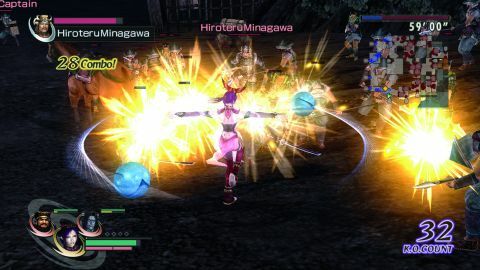 But it’s only the chance to perform triple Musou attacks with all members of your team and the chance to see the original Warriors Orochi through the eyes of the Orochi themselves that serve as any real, relevant addition. Frankly, everything else feels like rather feeble fan service. While Eastern audiences seem happily placated with this sequel (the fact that it draws so heavily from Chinese and Japanese history no doubt helps), we wonder why Omega Force can’t show some of the glimmers of innovation we saw in the likes of Bladestorm: The Hundred Years War. Warriors Orochi 2 claims to be tactical action but there doesn’t seem to be anything tactical about grinding your characters up to god-like status and endlessly plowing through waves of gormless foes. To us, Warriors Orochi feels like so many Warriors titles we’ve played before – mindless and lazily updated. There’s no doubt that the franchise needs to be seriously revolutionized. We can’t blame Koei for milking what has proved to be a very successful cash cow but surely it’s time to move on… perhaps give the fans something different to play and us something new to write about? The amount of content is frankly overwhelming and may appeal to those who have a lot of time to kill while traveling, but players new to the series should consider how deep their love for button-mashing goes before picking this one up.